Chef/Owner Shawn Paul Dalziel grew up in a California restaurant owned by his family and has since gained experience in a variety of places. He is a graduate of the California Culinary Institute, has trained in a number of fine restaurants, and has served as the Executive Chef in several New York City restaurants. His experience shows as does his magical touch with food. 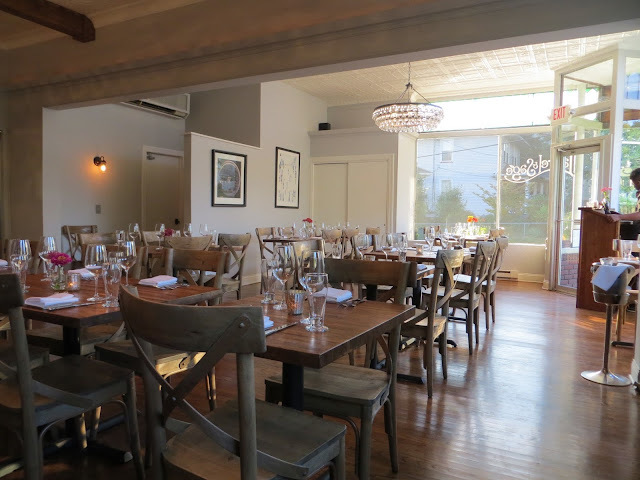 Dalziel opened this latest addition to Montclair's restaurant scene in 2015. Located in the spot previously occupied by Ariane Duarte's popular CulinAriane, Laurel & Sage is carrying on the tradition of outstanding cuisine at this corner location. Dalziel and his wife completely renovated the restaurant, opening up the space and adding a hip contemporary decor. The tables are made of beautiful wood as are the chairs. A hard wood floor, soft gray walls hung with minimal art, and simple but elegant ceiling fixtures make the restaurant feel comfortably spacious and special. We were welcomed by the wait staff, and since we were early, we were given our choice of table. Our server reviewed the menu and informed us that while they don't usually have daily specials they did have clams on the half shell and Alaskan King Crab Legs that Thursday night. We had several questions which were nicely answered. After we placed our orders, a server came over with a big square basket of homemade breads and popovers. We adore popovers which we've not seen served anywhere else, so we pounced on those. That night the chef had prepared two kinds of popovers, one with gruyere cheese and the other with rosemary. We'd be hard-pressed to choose a favorite. They were mouth-wateringly good. We also sampled the delicious mini-croissants. Then we were served a mini-course called the Amuse Bouche. This is a complimentary sample of something special that the chef prepares for each night's diners. It came as a delightful surprise. 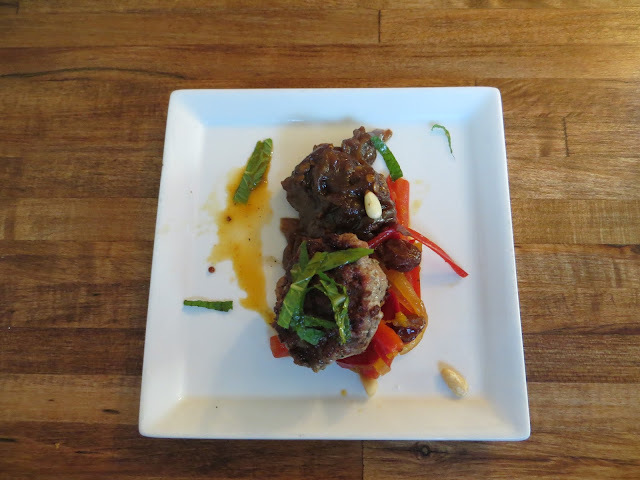 Our sample was a lamb slider with slivered peppers and a tasty sauce. Our mouths were indeed pleasantly amused. 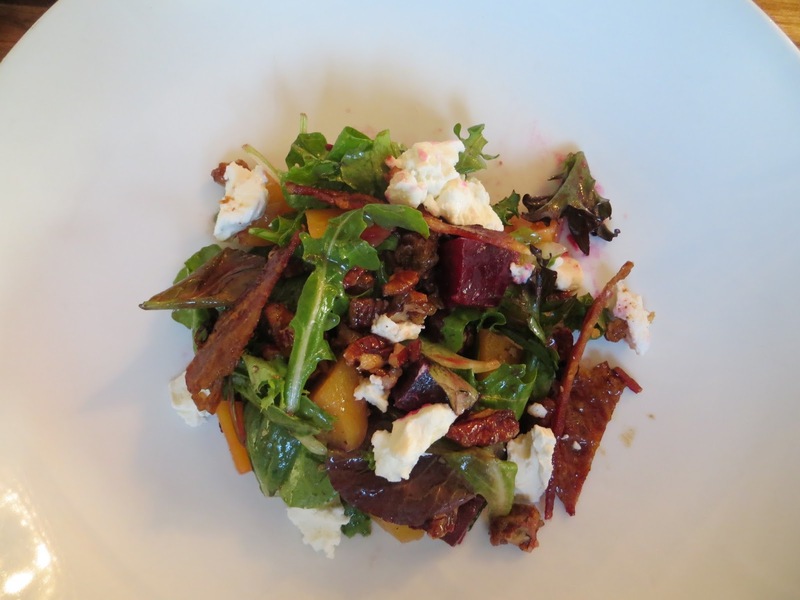 Then came a baby beet and greens salad. This included both red and gold beets, the latter which we'd never had before but hope to have again. The salad also included goat cheese, candied pecans, and bacon, all tossed with a really wonderful vinaigrette. 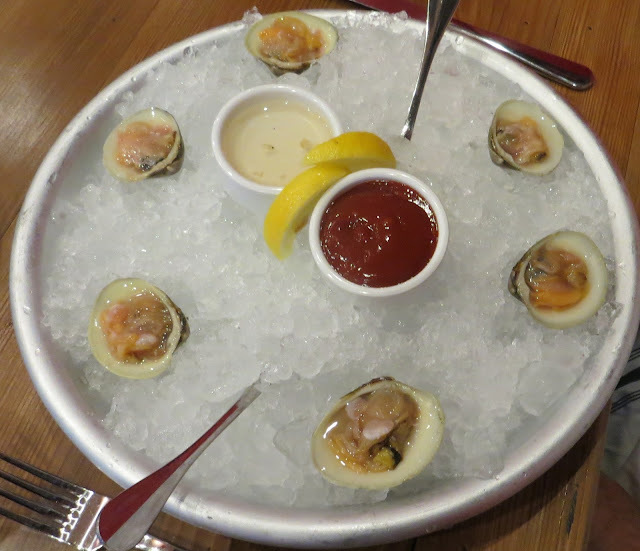 Our other appetizer was a dozen clams on the half shell. These were immaculate and very fresh. 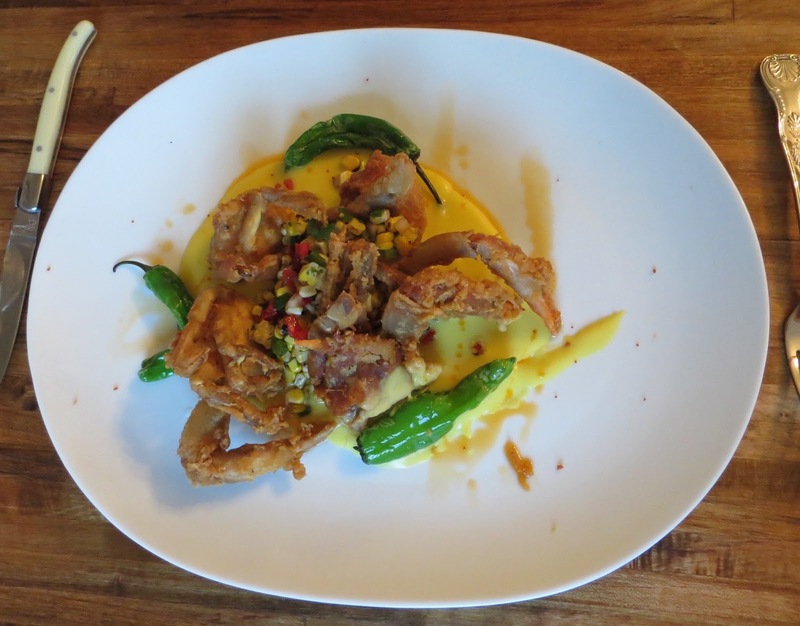 For entrees we had one order of the soft shell crab. This was coated and deep-fried so that it was nice and crispy. The crab was broken up and served with a zesty corn salsa and some corn pudding. Our second entree was a stuffed airline chicken breast. We found this dish to be especially delicious and unusual. The skin was crispy and beautifully seasoned. 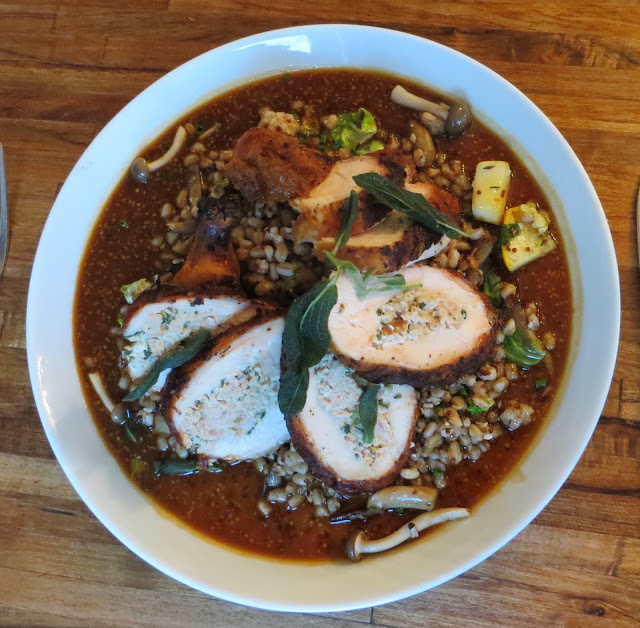 The chicken breast was stuffed with chicken sausage, served in round slices, and placed on top of farro pilaf which we thought similar to barley. All of this was surrounded by a delicious jus flavored with whole grain mustard and containing little mushrooms and other vegetables. Then onward to dessert. The profiteroles sounded irresistible so we easily gave in to them. 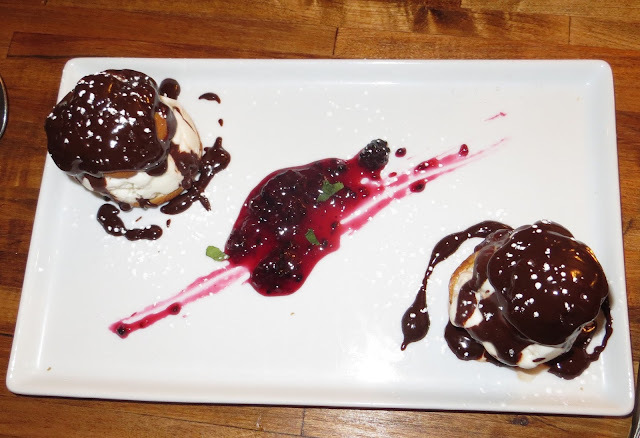 The puff pastries were filled with vanilla ice cream and topped with a rich chocolate sauce. A fruit compote accompanied the profiteroles and was a perfect counter to the chocolate sauce. 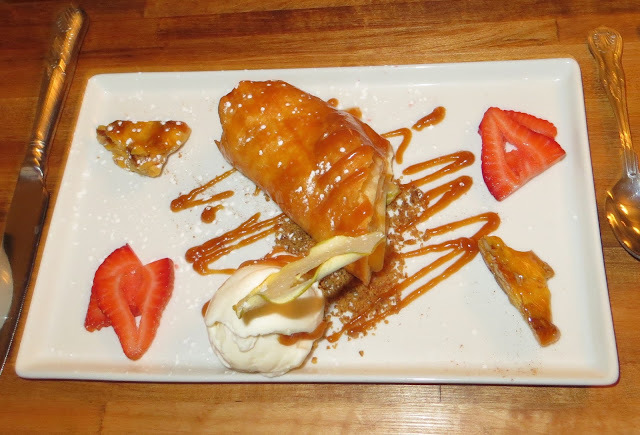 Our second dessert was the Apple Strudel. This dish is made to order so the flaky phyllo pastry and the apples were warm. This was topped with a sweet caramel sauce and served with a scoop of ice cream. Prices here are on the high side, but there's a range and you could skip dessert, though we don't recommend doing so. Laurel & Sage is now one of our favorite restaurants. We enjoyed everything about the place from the atmosphere, to the popovers, to the fabulous dishes. 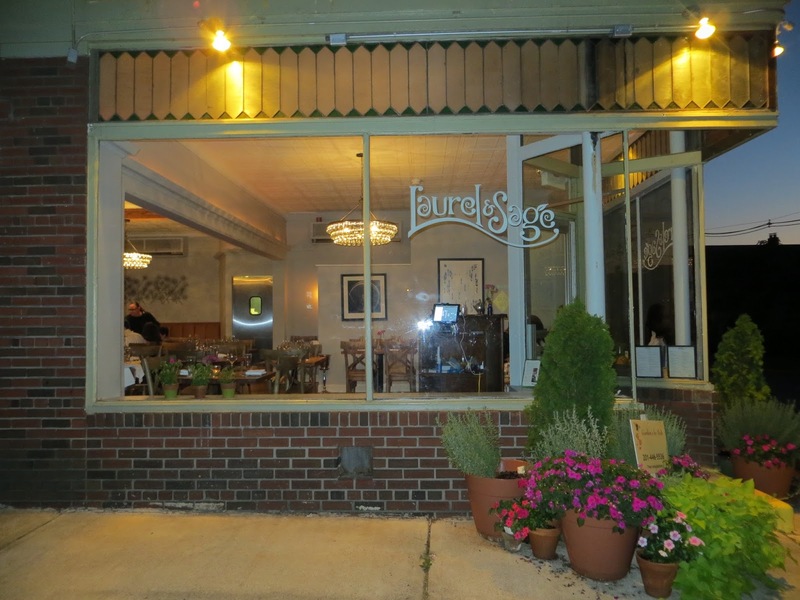 Laurel & Sage offers truly fine dining. We look forward to a return visit. And soon! Opened in October 2014, Ariane Kitchen & Bar quickly generated a lot of buzz and recognition from such reviewers as the New York Times and New Jersey Monthly. We stopped in on a Thursday night to see for ourselves what all the buzz was about. It’s about great food, service, and atmosphere. 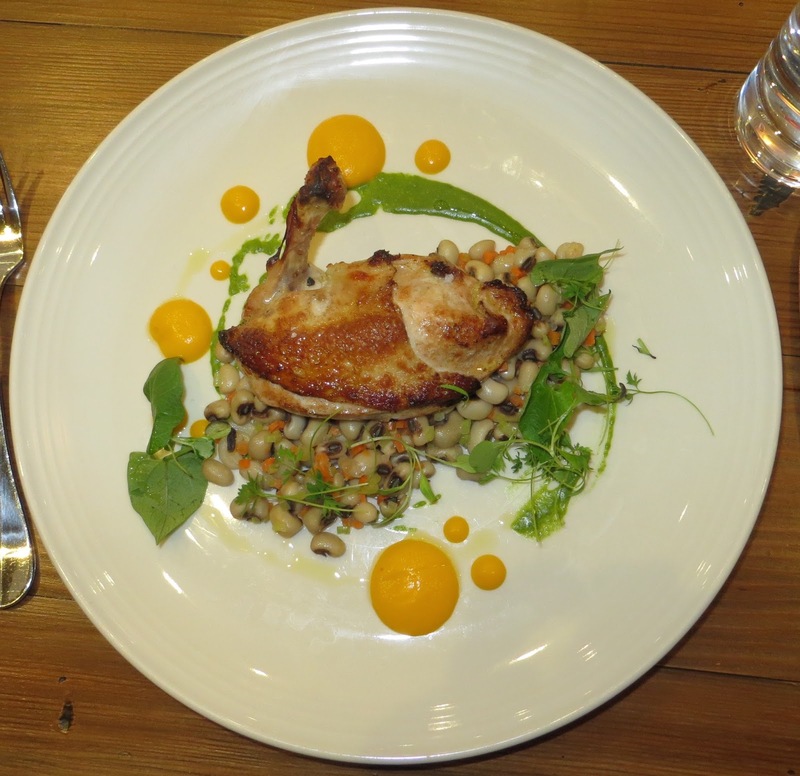 The head chef is co-owner Ariane Duarte, a graduate of the Culinary Institute of America. She has extensive experience in the kitchen having previously worked at Highlawn Pavilion in West Orange, her husband’s family restaurant in Chicago, and CulinAriane which she and her husband, Michael, owned in Montclair. Soon after Ariane’s appearances on television’s Top Chef Season 5 and later on Iron Chef, they found themselves fully booked every night and bursting at the seams at CulinAriane. So when they had the opportunity to open a new place in Verona with John MeEvoy, they grabbed it. Michael, also a graduate of the Culinary Institute, manages the restaurant. There are three dining areas in the restaurant. The bar area has high top tables for diners. Opening off that area is a small dining room with floor tables. 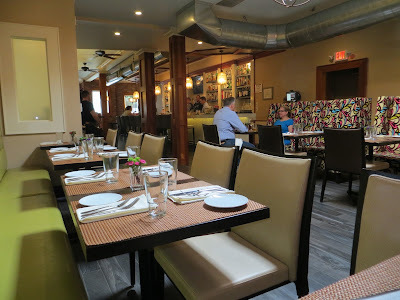 At the back of the restaurant, beyond the bar, is the third dining area which has banquet seating on both sides of the room. The decor is contemporary and upbeat. We were seated by the hostess. Our server soon arrived to take drink orders, give us the menus, and tell us the evening’s specials. The menu is limited but the chef offers one special appetizer and one entree each night and the menu changes four times a year. We had a number of questions for our server, all of which he was able to answer. We both wrestled with our choices, being tempted by several items. After we placed our order, we were served a basket of the most delicious croissants we’ve ever had—petite, delicate, and flaky with just a hint of something sweet on the top. 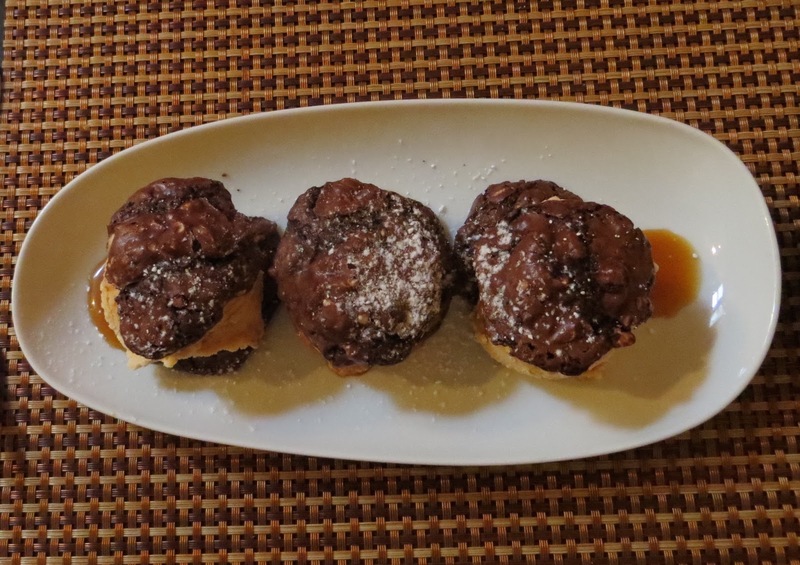 We grilled our server and learned that these are baked daily by the restaurant’s pastry chef. If nothing else had been good, we still would have considered our visit a good one if only for the croissants. But there was more, all of it beyond good. One of us began with the special salad that included a bed of lettuce surrounded by deep-fried rock shrimp and topped with sautéed onions, nuts, and bits of cheese. The dressing was outstanding. 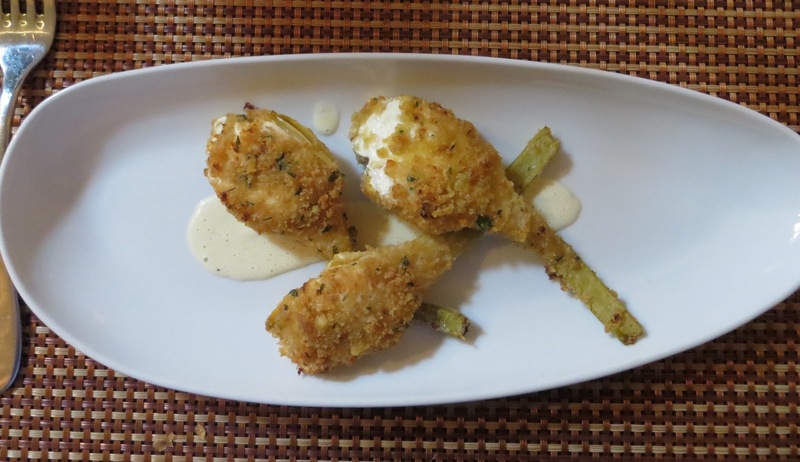 Our other appetizer was artichokes stuffed with goat cheese and drizzled with toasted garlic aioli. An unusual and tasty dish. 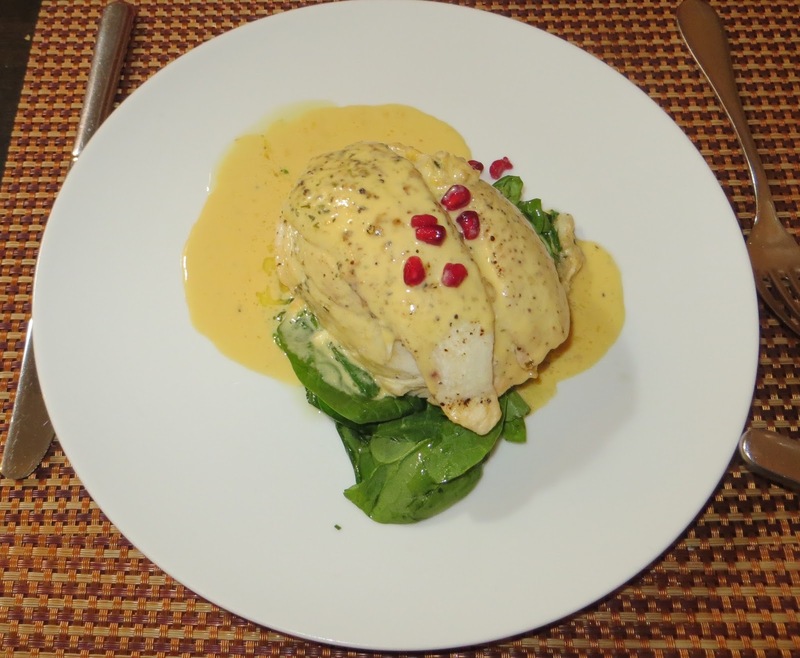 Our first entree was Crab meat stuffed flounder, served with spinach, pomegranate, and corn sauce. The stuffing was delicious as was the entire dish. It tasted as good as it looked. Our second entree was a half chicken that had been brined in sweet tea which gave the exterior a nice color and flavor. 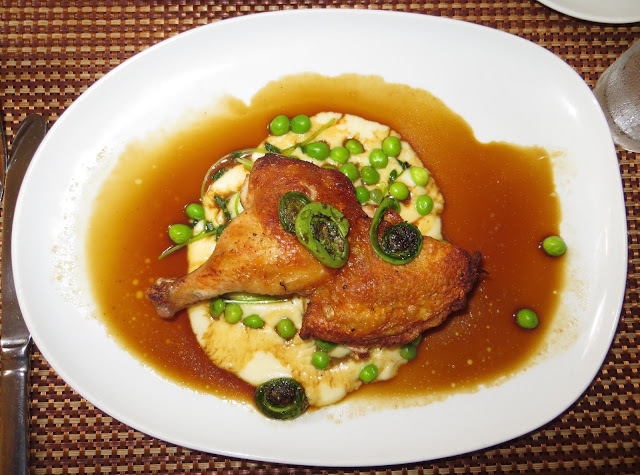 The chicken was drizzled with a dark jus and nestled on a bed of very smooth and creamy mashed potatoes mixed with peas. Then onward to dessert. Lew ordered the dessert that the waiter said was his favorite: chocolate, peanut, ice cream sandwiches filled with salted caramel ice cream. The sandwich part was homemade crispy cookies. This is now one of our favorite desserts, too! Loved those little sandwiches. We’re both bread pudding fans. The pastry chef offers a special bread pudding each night. 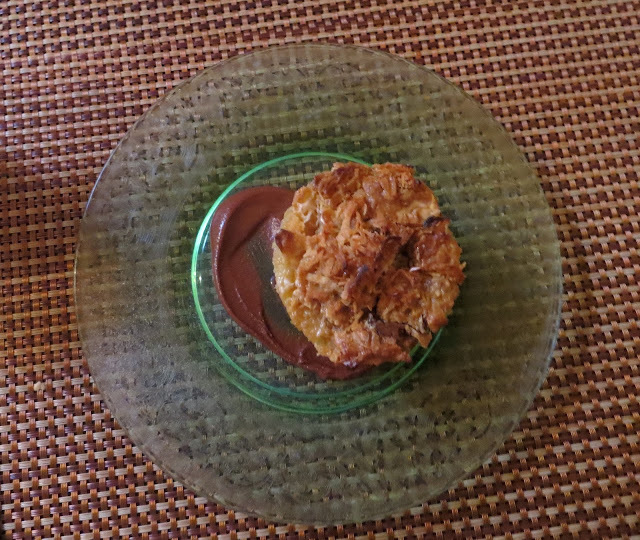 On our night the pudding was baked with some chocolate and marshmallows and then topped with toasted coconut. 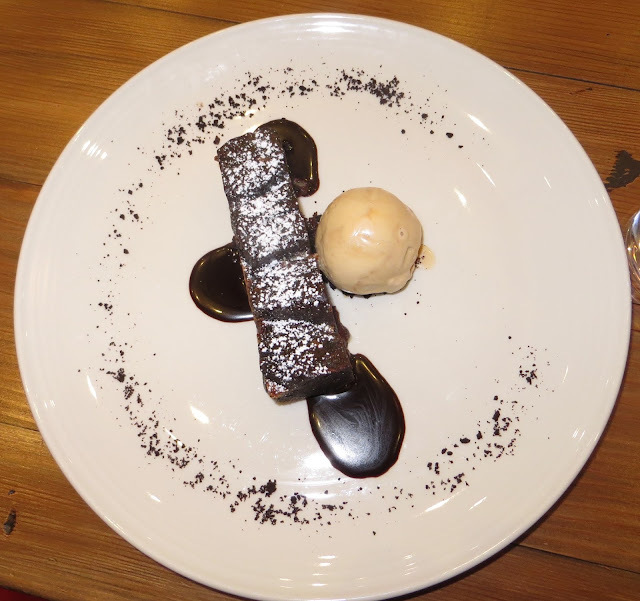 To make this completely irresistible, the pudding was surrounded by a fudgy chocolate sauce. The bread part was made from the previously mentioned croissants. The result was the lightest, fluffiest, best bread pudding we’ve ever had. Ariane Kitchen & Bar is slightly pricier than the other restaurants we’ve visited but not bad at all. And there’s a good range of prices to choose from. We’ll most definitely be back for more. In fact, we can't wait to return. We'd been waiting for several months to try Desi's. Although we were anxious to stop in, we like to wait a few months before we visit a new restaurant. It's not unusual for a new place to have some kinks to work out. We like to allow some time for those kinks to get resolved. We went for our first visit on a Thursday. If Desi's did have any kinks, they've been ironed out. The chefs at Desi’s are highly trained. And it shows. Head Chef Kenneth West and his assistant chefs pay as much attention to the appearance of the dishes as to the taste. The restaurant is still new and has the glow of newness. 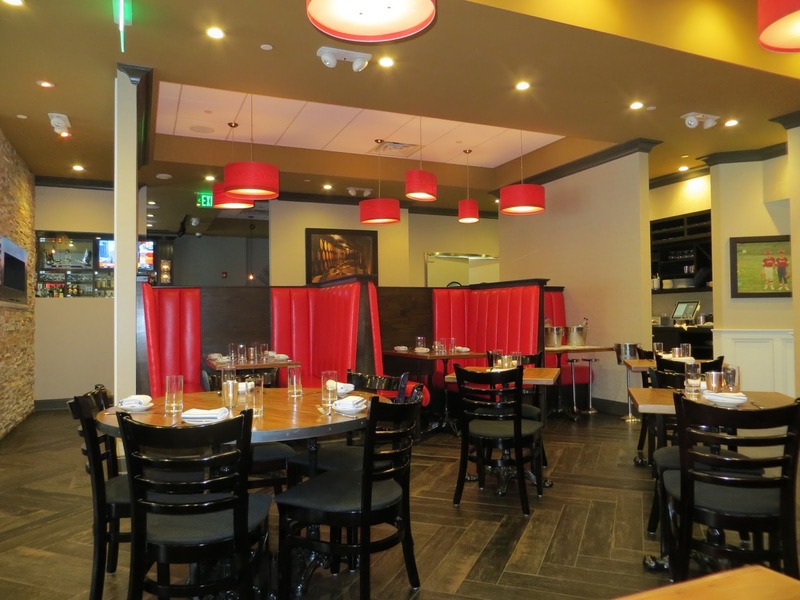 The dining room has attractive wood floors and wood tables as well as curved red leather booths along two walls. Good-looking glassware and silverware add some sparkle to the tables. Unlike at a lot of restaurants, diners here are given fresh silver with each course. We thought the service was excellent. Our table was ready at the time we’d booked for. The manager came over to our table and introduced himself to us. Our waitress was delightful, full of smiles and good cheer. She was attentive without being intrusive. The courses were served in a timely manner, neither too fast nor too slow. We sat in the dining room but could see through to the bar which had a lively after-work crowd sitting at the bar and at the high top tables. There’s a separate menu for Bar Snacks. It consists of seven items such as Bacon Grit Fritters, a Jersey Pretzel, and a Desi Burger. The Dinner Menu includes Raw Bar items and On the Half Shell items, all of which seem to be popular offerings here. Then there is also an interesting assortment of Starters to choose from. The Pasta part of the menu includes three items. The Main Entrees part of the menu includes ten dishes, several fish items among them. The menu is limited and there are no daily specials, but we easily found something to tempt us in each course. Bread was served along with oil which seemed to be unseasoned. This was the only item that seemed a bit flat to us. For starters we had an order of clams on the half shell. These were very fresh and came with two sauces. 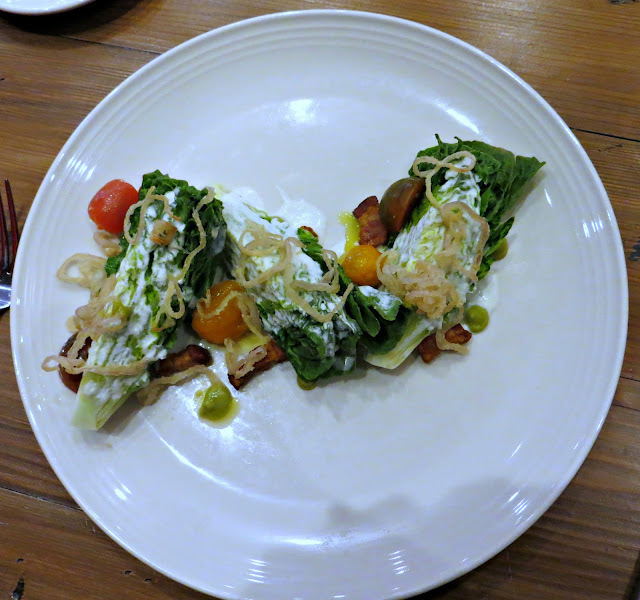 Our other starter was a salad of Romaine with avocado, bacon, and bleu cheese dressing. Two delicious touches in this salad were the scalded and peeled cherry tomatoes and the slivers of crispy fried onions that topped the salad. For entrees we had the only Chicken dish offered. This was delicious. The skin of the chicken was crisp and beautifully seasoned. This was served with black-eyed peas mixed with tiny diced carrots, an unusual and tasty vegetable combination. This also came with a sauce verte for dipping. Our second entree was Pasta Alla Chittara. The chittara pasta was topped with clams and paneetta and a light clear sauce. The pasta dish came in two sizes with two different prices. We ordered the smaller plate which was small but satisfied as it followed an appetizer. Heartier appetites might be well advised to order the larger plate. Desi's is one of a handful of area restaurants that has its own pastry chef. Pastry Chef Tiffany Parascand has trained under some top pastry chefs and in some elegant restaurants. This background is reflected in her desserts. Our first indulgence was the Brownie Bread Pudding. This seemed to us more brownie than bread pudding but was delicious. The fudge sauce added to the decadence as did the petite scoop of salted caramel gelato. Our second indulgence was the Cheesecake with Amaretti Crust. 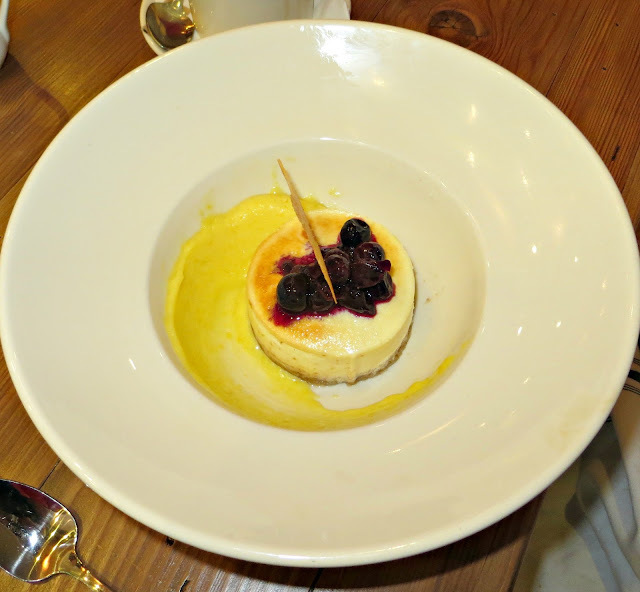 This was served in a deep dish, placed on top of lemon curd, and topped with blueberries. This was very pretty, unusual, and delicious. We observed several negative reviews at Yelp. A few mentioned being disappointed with the brunch. Brunch? Desi’s isn’t open until 5:00 PM and is closed on Sundays. Did they have brunch at one point? Or is this another example of Yelp reviews being unreliable? We very much enjoyed our first visit to Desi's. We recommended the restaurant to our daughter and son-in-law who stopped in several nights later and also gave three cheers for Desi’s. We’ll all be back again soon. Chef-Owner Matthew Pierone is a culinary school graduate and the recipient of numerous awards for his culinary skills including being named in 2013 and 2014 to the Best Chefs America Book. After having trained at some of New Jersey's best restaurants, in 2007 he realized his dream by buying his own restaurant, the Gourmet Cafe. We first knew Matt at The Huddle Inn in Fairfield where he worked as a chef back when we were the owners of that restaurant. We then followed him to Eccola in Parsippany and later tracked him down to his new place. We first went to the Gourmet Cafe shortly after it opened. On that visit we walked in on a Saturday night and just about had the place to ourselves. We knew that wouldn’t last long. Now eight years later when we walked in early on a Saturday night, the place was full. We were lucky to get a table on reserve because we promised we wouldn’t linger. The decor is casual and simply but nicely decorated. There is original art on the walls and soft lighting. Tables are covered with linen tablecloths and topped with glass. The restaurant offers a terrific lunch menu, including sandwiches, salads and pasta. The dinner menu includes a wide variety of choices without being overwhelming. Daily specials are also offered each evening. Several homemade desserts must not be skipped. The service is outstanding. 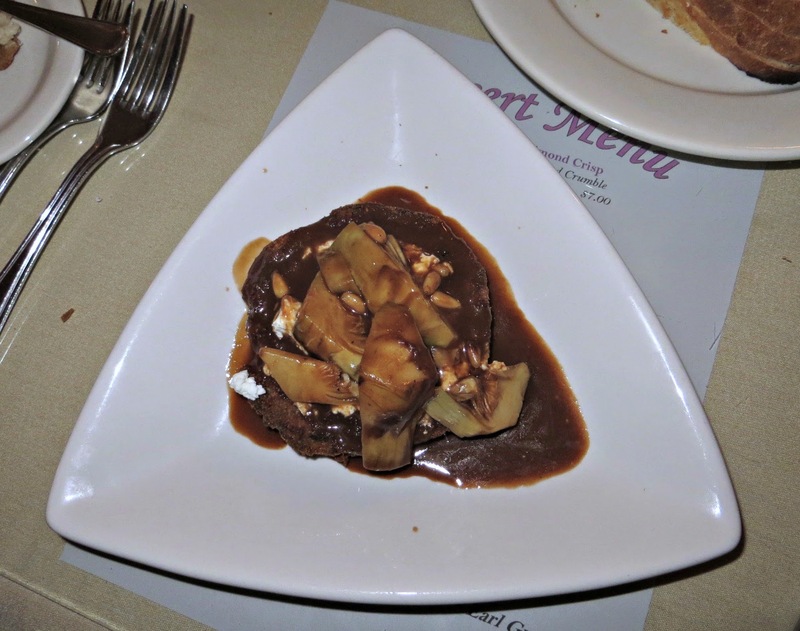 We began with the Crispy Portobello Mushroom appetizer which was topped with artichoke hearts, pignoli nuts, and goat cheese, then drizzled with a balsamic dressing. Delicious! 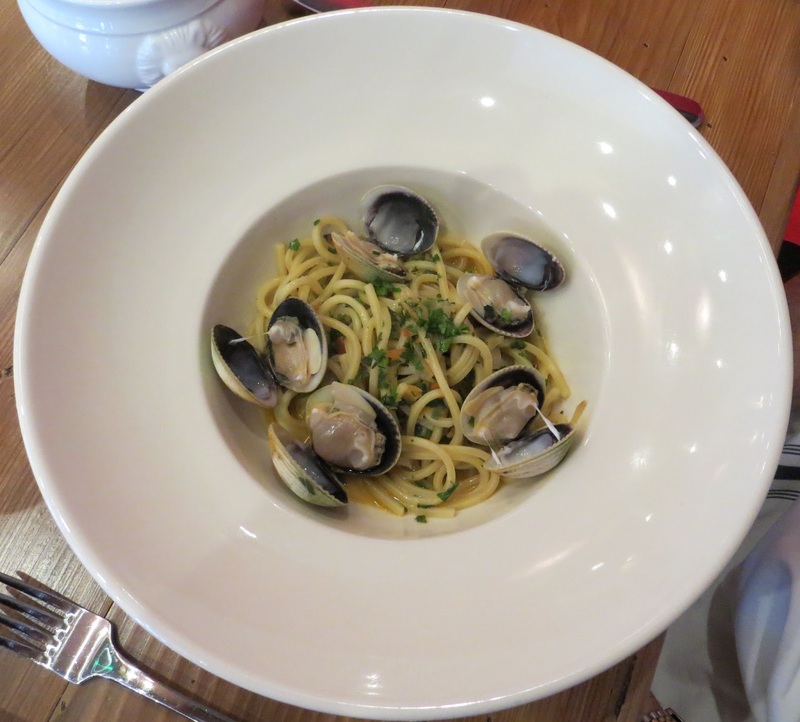 We also had an order of Classic Mussels which was served with fresh basil, garlic, and white wine in a plum tomato broth. We enjoyed this unique spin on an old classic. For entrees we chose one of the daily specials, Chicken Chasseur. The two boned chicken breasts were cooked to perfection, then topped with mushrooms, tomatoes, and scallions, then served in a shallot and Madeira wine sauce. This was accompanied by a mix of fresh carrots and squash. The dish was rounded off with some roasted sweet potatoes. We didn’t think we liked sweet potatoes; now we love them. This entire dish tasted just as good as it looked. We also chose a pasta dish off the regular menu. The Capellini with Shrimp came with a generous number of plump shrimp mixed with broccoli rabe and sun-dried tomatoes and a white wine and garlic sauce. This dish also pleased. For dessert Lew chose the warm butterscotch bread pudding served with vanilla ice cream. Diane went for the apple crisp which, as you can see, came with three butterscotch sauce-topped scoops of ice cream, all three of which were consumed. We went home fat and happy. We were so pleased with our dinner that we returned the following week. We headed down to Verona on the coldest night of the year, so the parking lot behind the restaurant was much appreciated. Once inside, we warmed up nicely, knowing we were going to have a good dinner. Chef Michael DiIonno gained local fame a few years ago when he won the championship spot on the TV Show “Chopped.” But we were already well-acquainted with his culinary skills as he was our chef years ago when we owned the Huddle Inn. When Michael first joined us, our business changed overnight. Suddenly diners were lining up at the bar two or three deep waiting for a table. Since those days, this chef has owned two of his own restaurants, one in Chatham and one in Livingston. DiIonno’s wife, Patty, serves as hostess. She has nicely decorated the two dining areas in black and white art deco style with soft lighting and attractive art on the walls. There’s a separate area for the full-service bar in addition to the main dining room and a smaller and quieter side dining room. 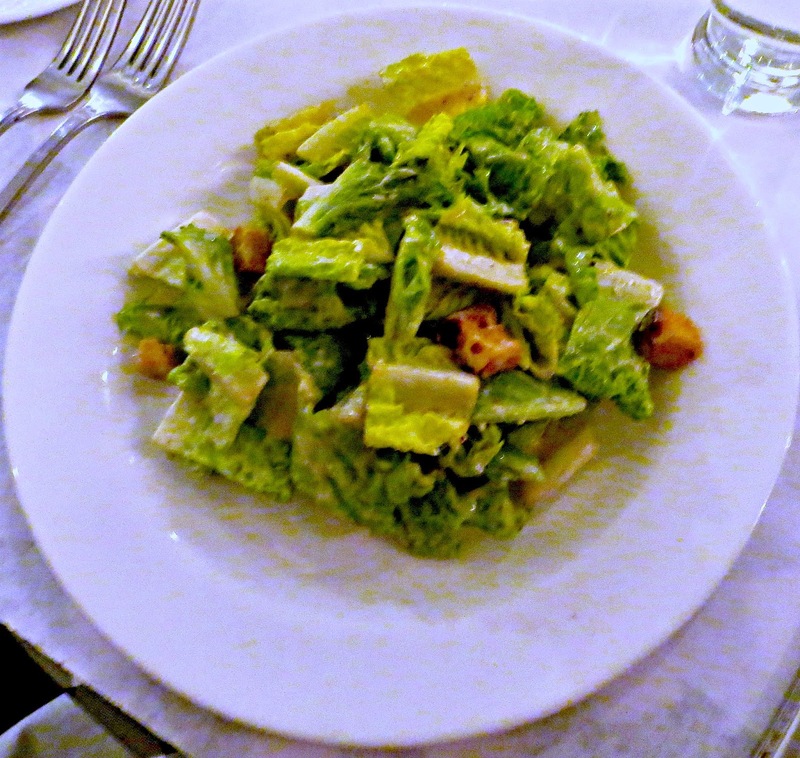 One of us began with the Caesar Salad with croutons, which is the house salad and a long-time favorite of ours. 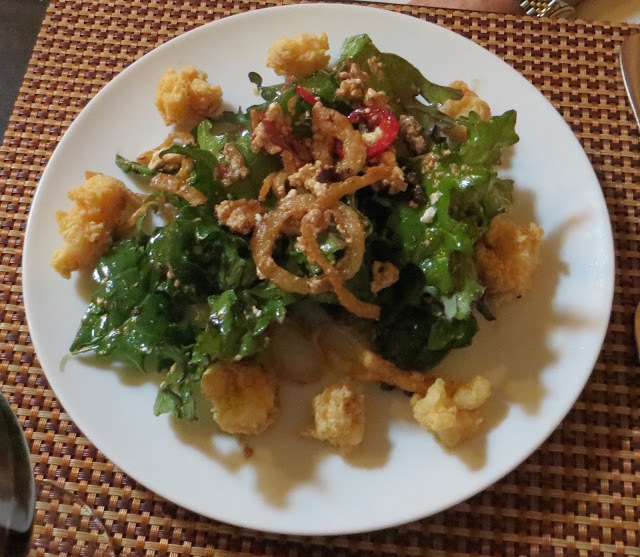 The lettuce was crisp and nicely broken into bite-size pieces, the dressing was light and delicious, and the croutons were tasty and crunchy. The other one of us started with the Mushroom Soup which he said was the best he’s ever had. 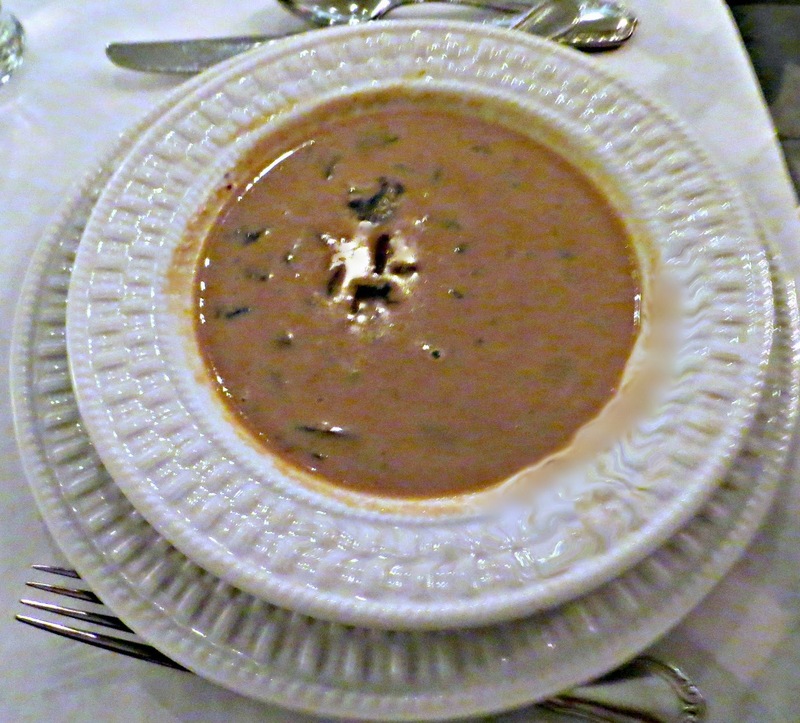 The soup was beautifully seasoned, generously filled with mushrooms, and not overly creamy. The menu offers quite a few selections, so we had a hard time making up our minds. We were torn between several entrees. But finally one entree we selected was the Lobster, Shrimp, and Scallops in Newburg Sauce over Fettucine. This was a very generous dish with lots of seafood and a very good sauce. Our other entree was Diver Scallops, pan seared, in a candied ginger sauce, served with white rice, and roasted, seasoned carrots. We would have liked something other than the plain white rice, but very much enjoyed the scallops and carrots. Then onward to dessert. We feel like we’re not really doing our job if we skip dessert. We are both fans of Bread Pudding, a dessert that few restaurants offer, so we were excited to find it on the menu at Avenue Bistro. On the night we were there, the flavor of the homemade pudding was butterscotch. No more thinking necessary! We ordered that and were not disappointed by the warm butterscotchy pudding drizzled with butterscotch sauce and topped with whipped cream. This is not a dessert for sissies or dieters. Our other dessert was Cookie Pie. This was also served warm so that the chocolate melted and mixed happily with the vanilla ice cream and whipped cream. Although we’d been putting off our restaurant visits lately due to snow and freezing temperatures, we were glad we ventured out to Avenue Bistro. We encourage you to do the same. Don’t wait until spring.